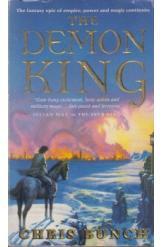 The Demon King by Chris Bunch, Sci Fi. Book is in good condition, all pages intact. General Damastes pledged his loyalty to the seer Damasdes and helped him become the king of Numantia. Only too late did the general realize his mistake, as the seer king's reign proved ruinous. Now, Damastes must attempt to overthrow his former liege, and learn the dark truth behind the seer's powers. Part of the Seer King series.